800 pt list from the Skythian or Saka list with a Black Sea Greek (Classical Greek) Ally. Special Rule — Aryanam — Kineas may affect allied troops as if they were in Line of Command. I have broken a chronological restriction here. Black Sea Greeks are only available as allies at 313 BC. Lancer CAV are only available after 300BC. “Early style” Greek hoplites are only available before 460 BC. I selected “Early style” Greek hoplites to represent the Olbians for 3 reasons: The majority are described in the text as well armoured, old fashioned in training (undrilled) and in need of Memnon’s leadership. If he leads the hoplites, they should be able to hold the phalanx as described in the text (-POA at impact but evens in melee). Undrilled, though not a perfect classification, seems appropriate as Memnon’s presence will negate the majority of the drawbacks and it will have little effect on the battle. The skirmishing Sindi archers are described as carrying heavy axes. For LF in FoG this is a useless melee capability and has been ignored. Satrax, perhaps justifiably the CinC, appears as a sub-commander in order to lead the flank march. This also allows our hero Kineas to orchestrate the battle as in the book and “bolster” or “lead from the front” any battle group — the special rule permits this fully. Kam Baqça, an odd choice for a commander, is given a role in order to “bolster” the faltering Sakje when they need it just as in the book (her retinue of 50 by no means justify a battle group). Alternatively, Kam Baqça could be swapped for Marthax and ride with the flank march. 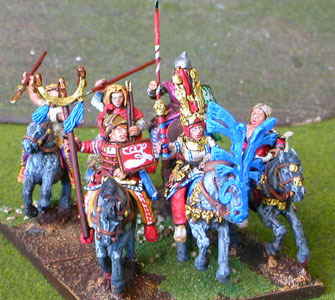 The Skythians (Sakje) themselves are best represented as CAV in this case. They will be required to mix-it-up with other heavy cavalry, and designating them as LH will not permit this.